Everyone has a bit of a Mediterranean Soul in them… So I thought what better recipe to share with you all before the last weekend in April, than the perfect BBQ Mediterranean Sole. I know I am not the only one who is NOT in favor of cooking fish in the house, it leaves a persistent odor that last hours and hours on end! This is precisely the reason I have resorted to cooking fish on the Q! It will save time, energy and prevent your nausea in the morning. 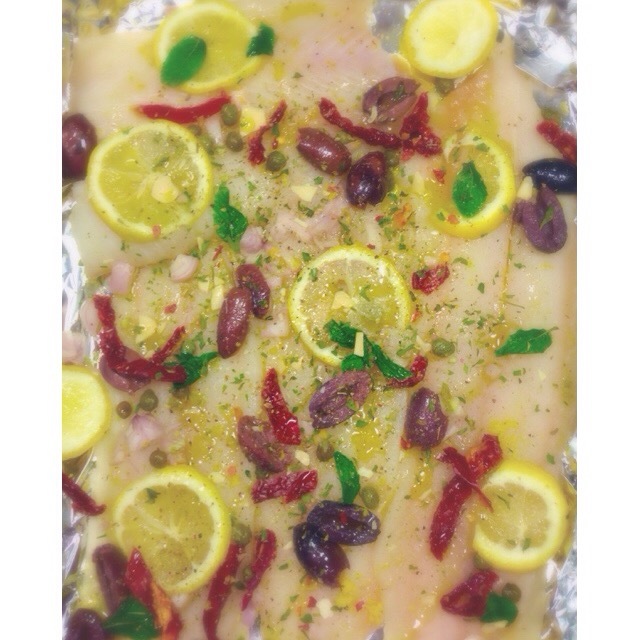 Start off by making an aluminum foil basket & placing it on a BBQ safe metal cooking tray; once we’re done prepping and cleaning the fish, place it on Low Fire for about 15-17 Minutes and you will be loving the results… this is how we make our Mediterranean Sole! Roast alla’ BBQ and Enjoy!